Good wine movies are so rare, and here's one that comes with a free glass of wine. "Tu seras mon fils" -- also known as "You Will Be My Son" -- opens this weekend in the UK and Ireland with a great promotion that we'll never see in the US: a free glass of Bordeaux. The film was shot at Clos Fourtet in Saint-Émilion, and in the UK you'll actually get a glass of the second-label, Closerie de Fourtet 2007. Very cool. "Tu seras mon fils" is about a wealthy Bordeaux chateau owner who considers himself the height of sophistication, yet can't stand his own son. The title, translated as "You will be my son," telegraphs the relationship he wants to have with the son of his winemaker. The film is very French: high acidity, no residual sugar. On the 5-star scale, I'd give it 3. But we're all wine lovers here; a 3-star wine movie is a must-see for us. Don't despair, US readers, the film is scheduled to be released here next year, though if you can't wait, you can order a DVD if you have a multi-region player. California audiences will share a few special wry chuckles. The winemaker's son jets into the story from his job as head winemaker at Coppola, bearing a bottle of Rubicon. I don't need to tell you how the Bordeaux snob reacts to tasting Rubicon. Like everything else involving wine in the film, it's accurate. In fact, I wonder how well audiences who don't know much about wine will understand a few key plot points, because the film doesn't spoon-feed you: if it rains during harvest, you're supposed to know what that means. Maybe this isn't a problem in France, but I suspect it will keep the film here from getting outside New York, San Francisco and LA. I hate spoilers so I won't describe past about the 25-minute mark, but if that's too far for you, don't read on. The chateau faces a problem at harvest when the longtime winemaker takes ill. The owner's son studied enology and has been preparing to take over this role for his entire life. But the owner despises him and mocks him at every turn. When the winemaker's son flies in to visit his father in the hospital, he quickly ends up volunteering to oversee the harvest. Naturally, this irritates the owner's son. The rest of the film is, I repeat, very French: adult conversations, many of them shockingly frank. Fortunately the film has a good-sized budget, so the Bordeaux cinematography is beautiful and the acting is first-rate. The film made me wish for a cameo by Robert Parker. This chateau owner is so arrogant, yet believes he is so cultured, that it gave me pleasure to imagine him kowtowing to someone, anyone. 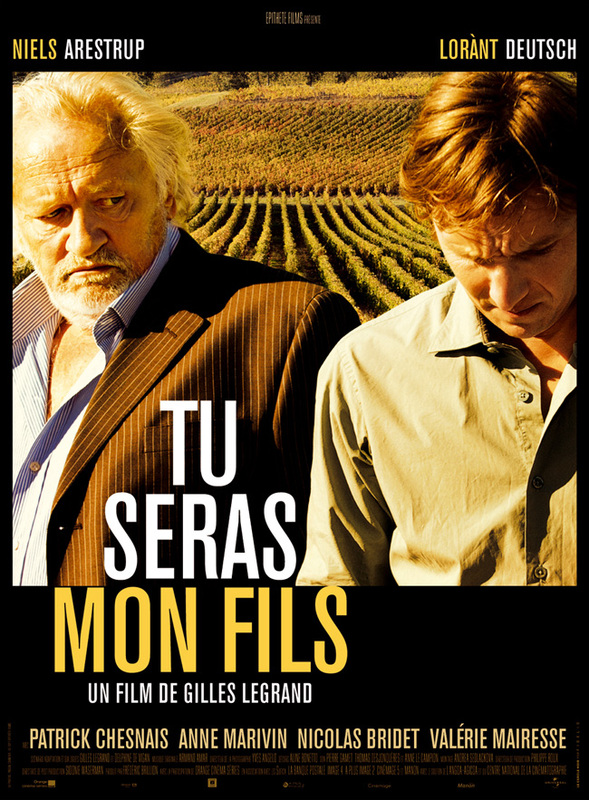 Here's the trailer for "Tu seras mon fils." It's subtitled in English.